The year 1912 in art involved some significant events and new works. January 5 (Old Style December 23, 1911) – Moscow Art Theatre production of Hamlet, designed by Edward Gordon Craig, opens. May – The Blue Rider Almanac published in Munich, containing reproductions of more than 140 multi-ethnic artworks, articles on the visual arts and music and Vasilly Kandinsky's experimental theater composition The Yellow Sound. June 26 – Austrian writer Frida Strindberg opens The Cave of the Golden Calf, a London nightclub decorated by Spencer Gore, Wyndham Lewis, Charles Ginner and Jacob Epstein with its motif by Eric Gill; it becomes a haunt of Futurists. July – At the 1912 Summer Olympics in Stockholm, American marksman, horse breeder and artist Walter W. Winans wins a silver medal for shooting and a gold in the sculpture category of the art competitions for his bronze statuette An American Trotter. December 24 – William Zorach marries Marguerite Thompson. 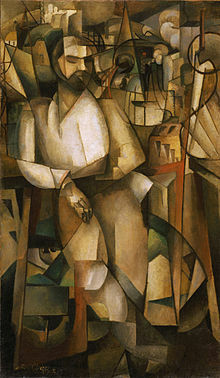 In Paris, Albert Gleizes and Jean Metzinger publish the first major treatise on Cubism, Du "Cubisme", followed by André Salmon's La jeune peinture française including Histoire anecdotique du cubisme. Ludwig Meidner begins producing his "Apocalyptic Landscapes". March – Exhibition of Italian Futurism transfers from Paris to the Sackville Gallery in London, organised by Robert René Meyer-Sée. May 25–September 30 – Third International Art Exhibition organized by Sonderbund westdeutscher Kunstfreunde und Künstler, in Cologne (Ausstellungshalle der Stadt Cöln am Aachener Tor), featuring works by Vincent van Gogh, Paul Cézanne, Paul Gauguin, Pablo Picasso, Henri-Edmond Cross, Paul Signac and Edvard Munch. Second Post-Impressionist Exhibition organized by Roger Fry in London. René Lalique and Maurice Marinot independently stage the first exhibitions of their glasswares. Roger de la Fresnaye - "Mon Ami, Jean Cocteau"
^ "Bishop John Carroll, (sculpture)". Smithsonian Institution Research Information System. 2016. Retrieved October 29, 2018. ^ Koetzle, Hans-Michael (2005). Photo Icons. Taschen. pp. 132–41. ISBN 3-8228-4096-3. ^ Elizabeth Forbes Penlee House. Retrieved 14 October 2012.